Homeless residents are testing the scope of the recent Martin v. Boise decision in a bid to stop camp closures. Anita Miralle and her attorney Joshua Piovia-Scott before today's hearing. 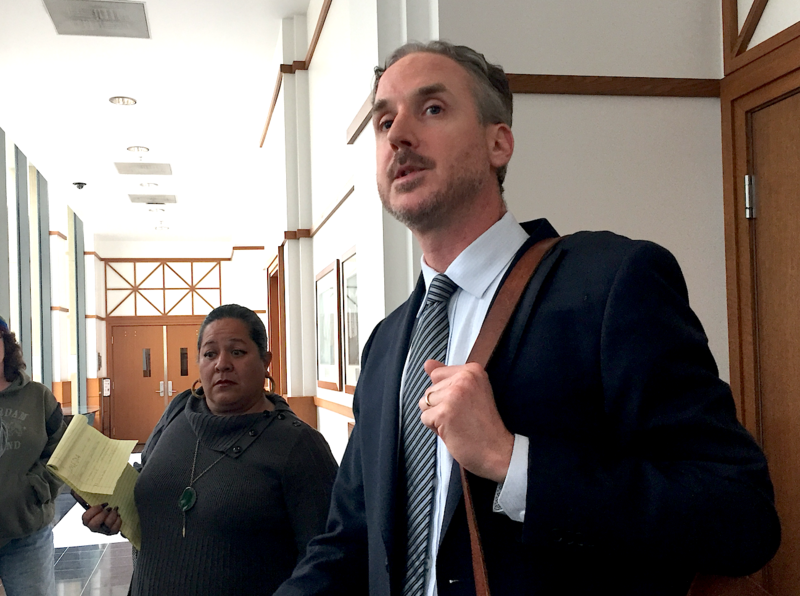 At hearing in Oakland today, U.S. District Judge Haywood Gilliam allowed a temporary restraining order preventing the city of Oakland from closing a homeless camp to remain in effect until at least Nov. 26 when there will be a second hearing to determine whether or not the city is violating the rights of homeless people. The camp's residents allege that the city is violating their 8th Amendment right against cruel and unusual punishment by effectively criminalizing camping and other life sustaining activities without offering adequate shelter. They also allege the city is violating their 14th Amendment rights by denying them due process and equal protection under the law. The case is one of the first legal tests to see just how far judges might go in interpreting the recent Martin v. Boise decision in which the 9th Circuit Court of Appeals found that laws criminalizing homelessness are unconstitutional if a city isn't offering adequate shelter. "The main thrust is under the Martin v. Boise case," Joshua Piovia-Scott told Judge Gilliam during today's hearing. He said there are currently about 300 to 350 shelter beds available in Oakland while there are about 1,902 unhoused people. Anita Miralle, one of the homeless Oakland residents who filed the case, wrote in a declaration that she attempted to call telephone numbers of shelters on the city's camp closure notice, but that most of her calls went unanswered. One shelter informed her they cannot accommodate pets, while another shelter told her they have no bed spaces. Another hotline she called informed her there are currently no shelter spaces available in the county. The plaintiffs, who now call themselves "Housing and Dignity Village," wrote in court documents that their camp is a clean and sober space that provides shelter mainly for women and children. Housing and Dignity Village is the latest in a series of protest camps that have sought to create self-organized communities of unsheltered people. They have often clashed with city officials over the issue of camp closures and the lack of resources like portable toilets at camps. First established in North Oakland's Grove Shafter Park in January 2017, the camp was closed by the city one month into its existence. A year later, many of the same activists, some of who are homeless, re-established the camp on a vacant city-owned lot in Fruitvale, but this site is scheduled to be closed due to construction activities. The new iteration of the camp was established on Oct. 27 in the deep-East Oakland neighborhood of Brookfield Village. On Nov. 7, Oakland police officers posted notices informing the camp residents that they were illegally occupying the property — an empty lot owned by the city of Oakland. The notices informed residents that they should leave the area by Nov. 10. Assistant City Administrator Joe Devries said after today's court hearing that he cannot comment on the lawsuit or the city's reasons for asking the camp to vacate the property. But Deputy City Attorney Jamilah Jefferson said during the hearing that the city is worried that the camp could expand in numbers and that structures might be built on it between now and Nov. 26, when the merits of the case will be argued and when the judge is expected to issue a ruling. If this happens, it could end up costing the city more to remove the camp. Jefferson had asked that the judge withdraw the temporary restraining order, arguing that the homeless activists can't claim that their situation is similar to the Martin v. Boise case, because the city of Oakland has no plans to arrest or cite homeless people for being at the camp. She added that the camp is located near a school, a senior center, and a library, all in a residential neighborhood. "The city is not arresting individuals," said Jefferson. Instead, she said the city's public works department is closing the camp, and that there isn't any criminal law being enforced against the homeless. Judge Gilliam declined to take a position today, however, saying he needs to see actual records of what the city is doing in order to rule on whether or not it amounts to a possible violation of people's constitutional rights. Until the 26th, he asked that the city and the homeless residents agree to take no further actions that would change the status quo, including any efforts to remove the camp or steps by the campers to move more people in and build structures.